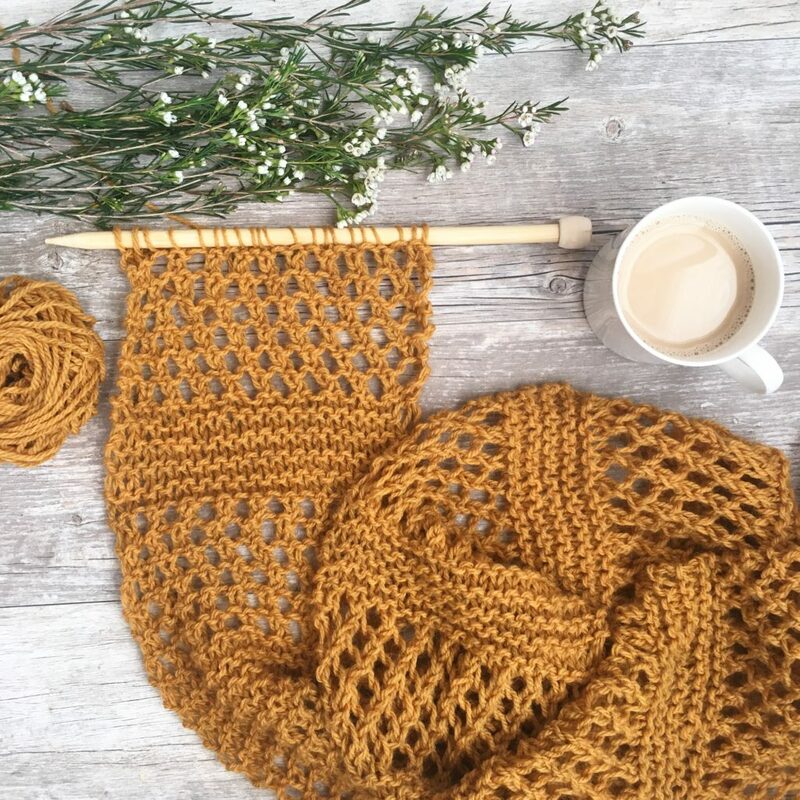 Doesn’t this almost look knit? My girl loves her new hat. I let her pick the pom and she went with white. I’m staying on the big and chunky train, and have also hopped on the faux fur pom train for this hat. I have so much super bulky yarn left from projects over the last few months! It was time to use up some of that yarn, so you’ll find that for the black hat I used up my Lion Brand Wool Ease Thick & Quick yarn. The cream hat is a mix of my Lion Brand Hometown USA and my We Are Knitters super bulky wool in Salmon. For the cream and salmon hat, I simply made the ribbed brim a bit shorter so that it would fit my daughter. The salmon yarn was from the recent Deja Vu Hat that I posted from We Are Knitters. I found the poms, which are actually key chains from the store Claire’s Boutique. The faux fur pom hats are all over the stores these days, right? 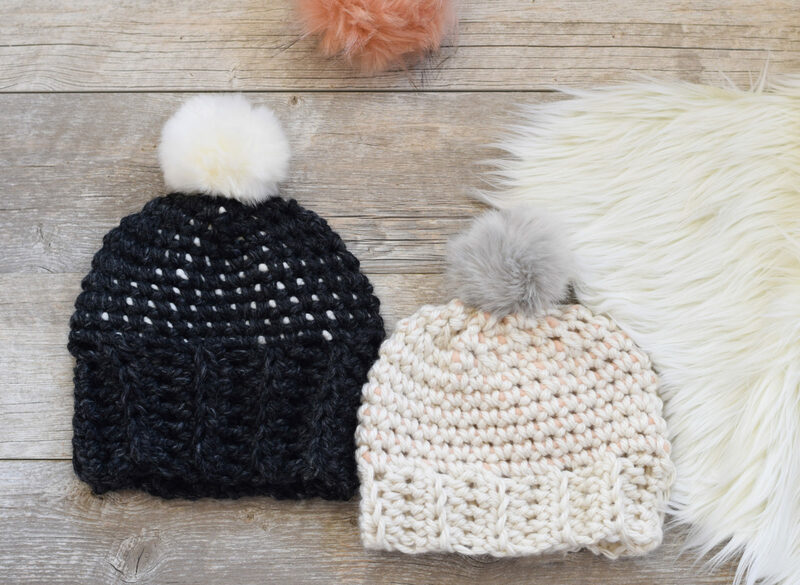 I called around to the Michaels stores in my city and none of them had the faux pom poms in stock (even though it turns out that they did – read on). I then went on a crazy fur pom pom hunt through the local mall. I found some at H&M that were around $6.00, but I really wanted to have the pink one which I found at Claires Boutique. They were between $9.99 and $12.00!!! UGHH! That is a receipt that I will be hiding from the husband! They had smaller ones at Claire’s that were $5.99 and were attached to hair ties. I suggest getting a Michaels 50% off coupon and buying their pom key chains. In this case, they’d be reasonable at just a few bucks. AND, if you call Michaels make sure to ask if they have the Pom KEY CHAINS. They had them the entire time, but only looked for faux fur poms without key chains attached of course. Now I know! I asked you on Facebook and Instagram if I should go with the pink or white, and it seemed most of you liked the pink! I actually kept both and tied the pom on in a manner that I can change it easily. Then I can wear it both ways and switch it up. I’m just not sure that I’m adventurous enough for the pink. One can never wear too much yarn. 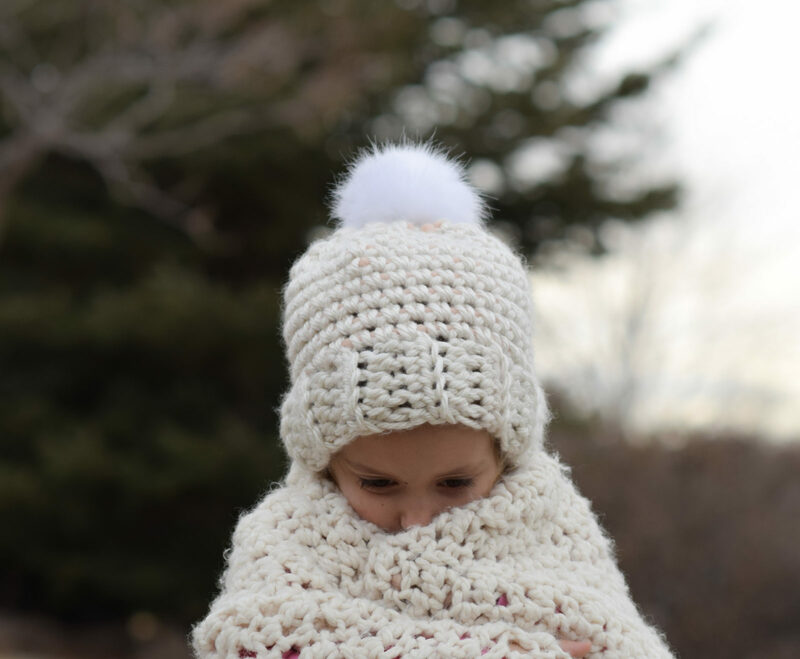 Ready to crochet this easy, peasy hat? 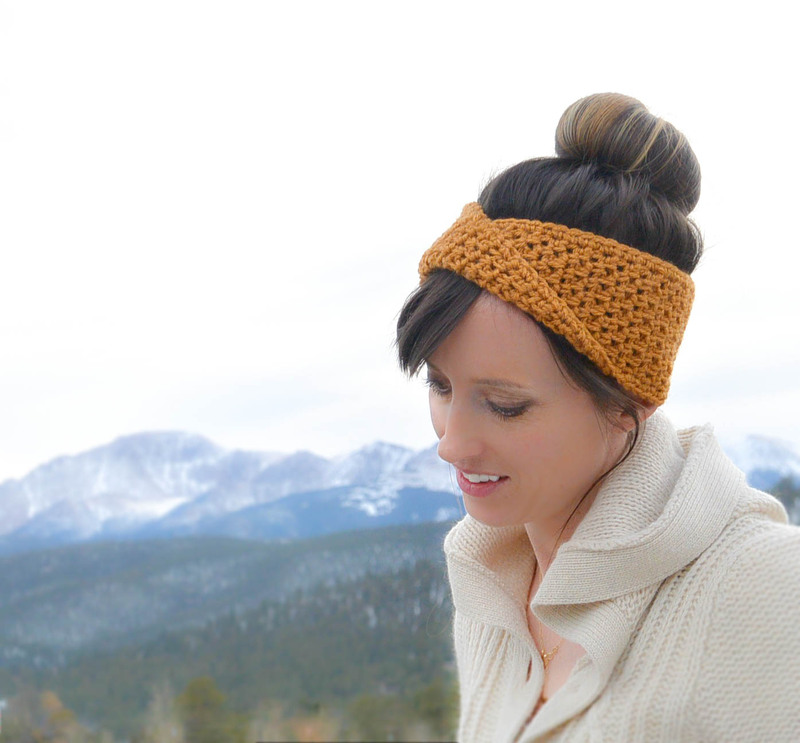 This crocheted hat features flecks of color that add dimension and interest! 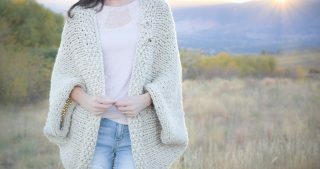 The unique look of the stitch and pattern creates almost a knit look, yet it can be done even by someone who is fairly new to crochet. The dark contrast with the light is reminiscent of beautiful, starry skies. 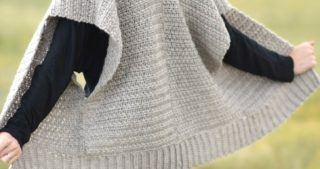 This is also noted below, but you need to pull the contrast color as you work to tighten as you will find it bunching up on the inside of the hat. 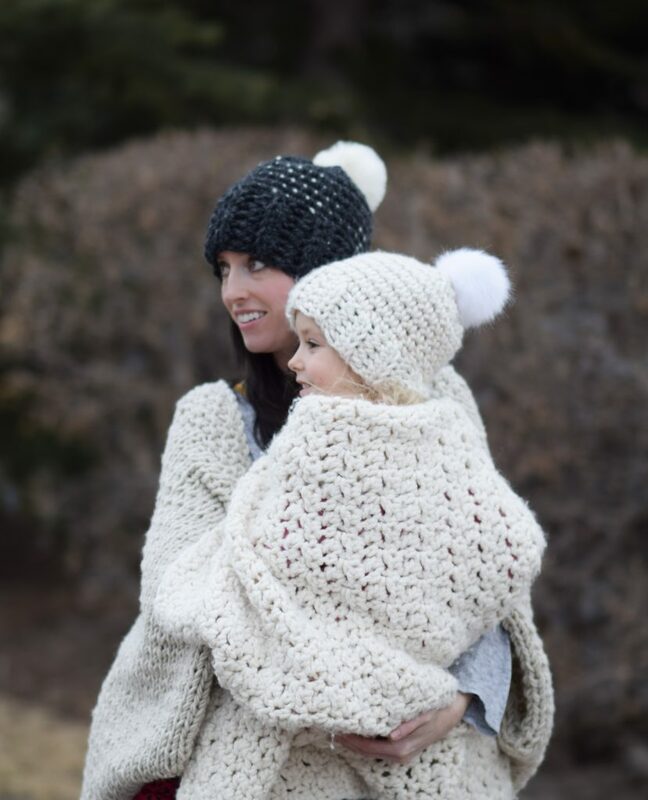 However, also keep the hat nice and loose by stretching it once you have kept the contrast color from bunching. 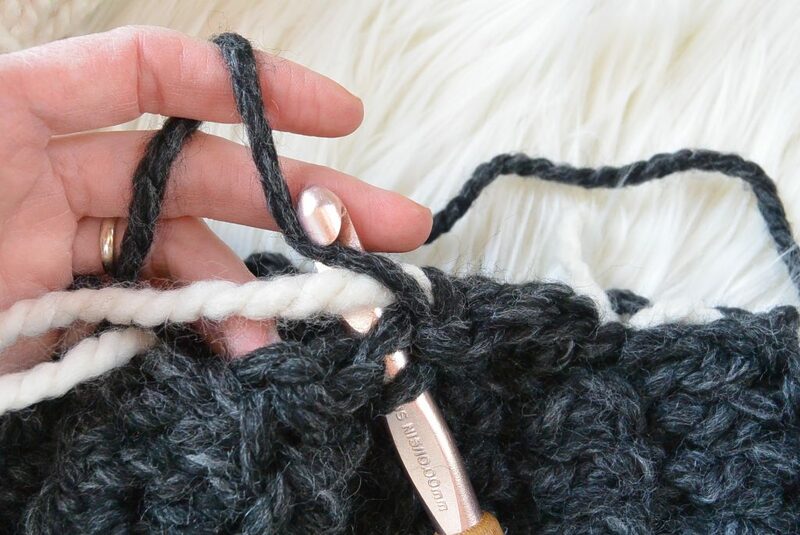 Simply give your work a tug from both sides simultaneously as you finish each row to ensure you’re not crocheting too tightly and that your hat will fit comfortable. Row 2 Ch 1, *hdc in back loop only in 2nd stitch from hook*. Repeat from * to * across. (7 stitches) Turn. You will now join the two ends together. 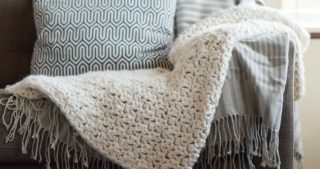 You can do this with your preferred method (such as in invisible seam method) or with a simple whip stitch using your tapestry needle. Above, you can see that the two ends have been joined and now you will proceed to the mid and upper section. 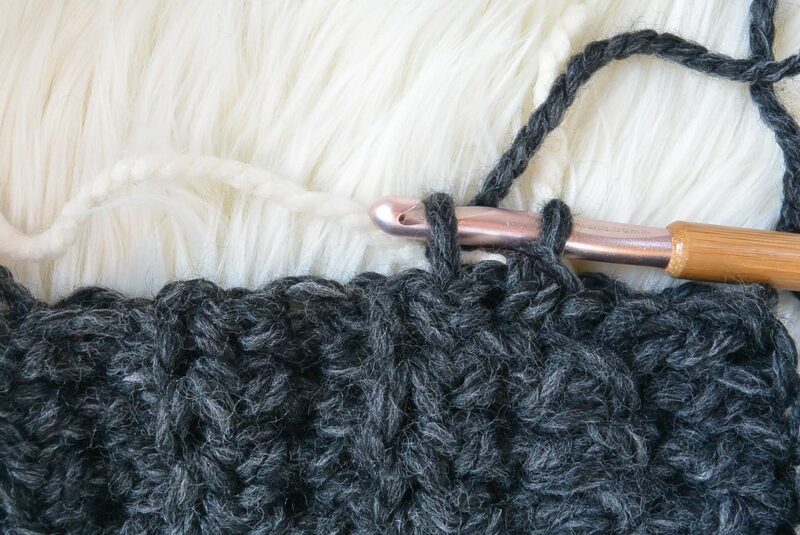 Attach your yarn to the upper portion of the ribbed portion with a slip stitch to secure. You may also secure the Fisherman (contrast color) with simple knot for extra durability and so it doesn’t pull out as you will now begin to carry it through your hat. 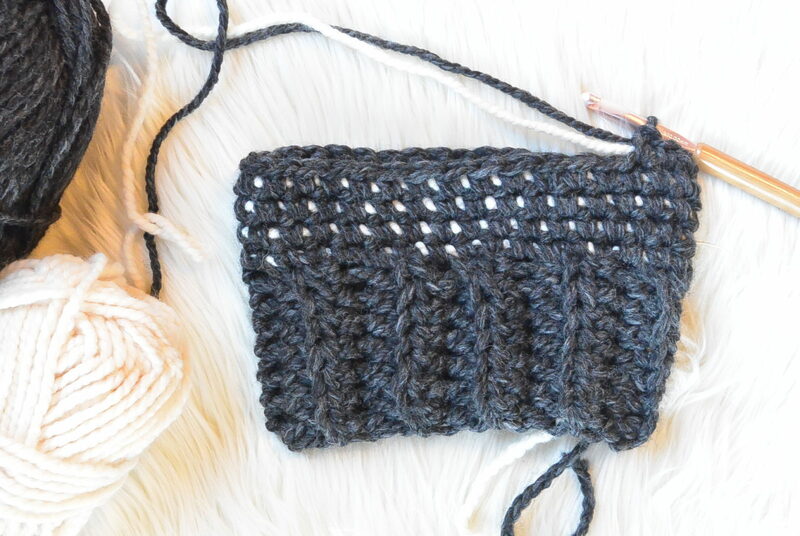 Carrying the contrast color of yarn along your work, you will single crochet around it as you go (Be sure to see my picture tutorial below). In other words, you single crochet as you normally would, only there is a piece of yarn running through it! IMPORTANT: Also, make sure you keep the contrast color from bunching up by looking at the inside of the hat for bunching and pulling the contrast color gently as you go. Be sure to keep your hat loose and stretchy by tugging both ends as if to stretch the hat every so often. This tugging will also enable the white to show through nicely. Round 1 Sc evenly around, with the contrast color inside of your stitches, making a total of 35 stitches around. Round 9 Sc around, keeping your contrast color on the inside as you have done throughout this portion of the hat. First, secure your contrast yarn to the hat so that it won’t come out or pull downwards by tying it with a knot to your main color at the top of the hat. Now, with a length of yarn and your tapestry needle, work through each stitch at the top of the hat. Pull tightly to secure and to cinch the top of the hat closed. 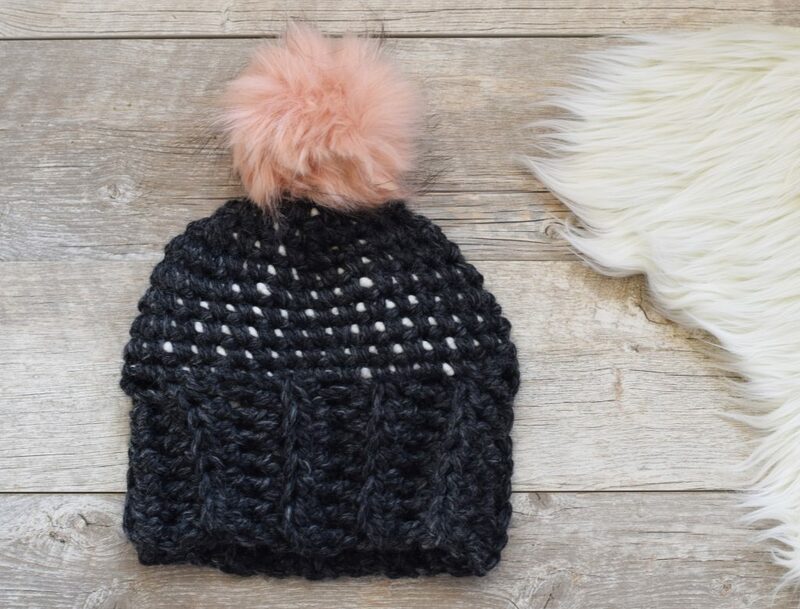 You can then either make a pom-pom by hand, with a tool, or as pictured, use a store bought faux fur pom! 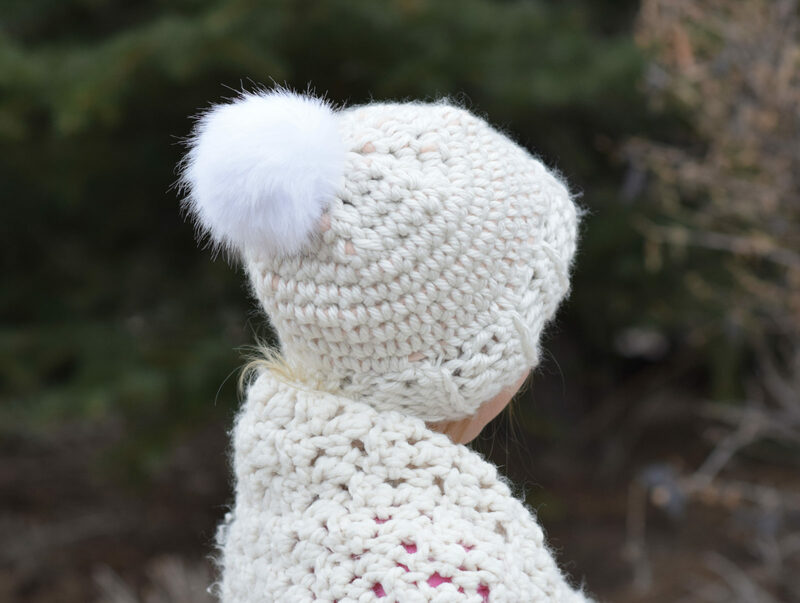 If you have a faux fur pom as pictured, I found the easiest way to attach it was with either by using a small tapestry needle and crochet thread or a sewing needle and thread. Be sure you work through the pom and your hat several times to secure. Tie off, weave in ends if necessary. See how I’m about to crochet AROUND the yarn? That’s all you do for the entire hat. 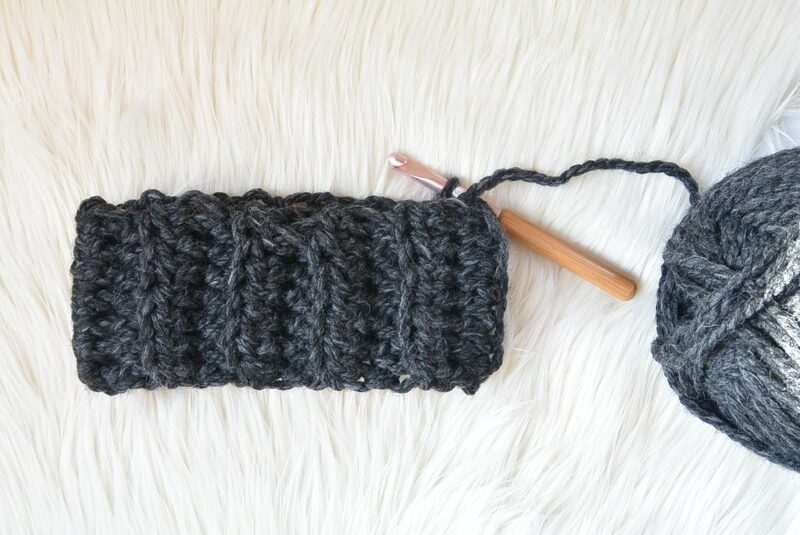 Simply carry that cream yarn along while you crochet the black yarn around it. It will begin to look like this! 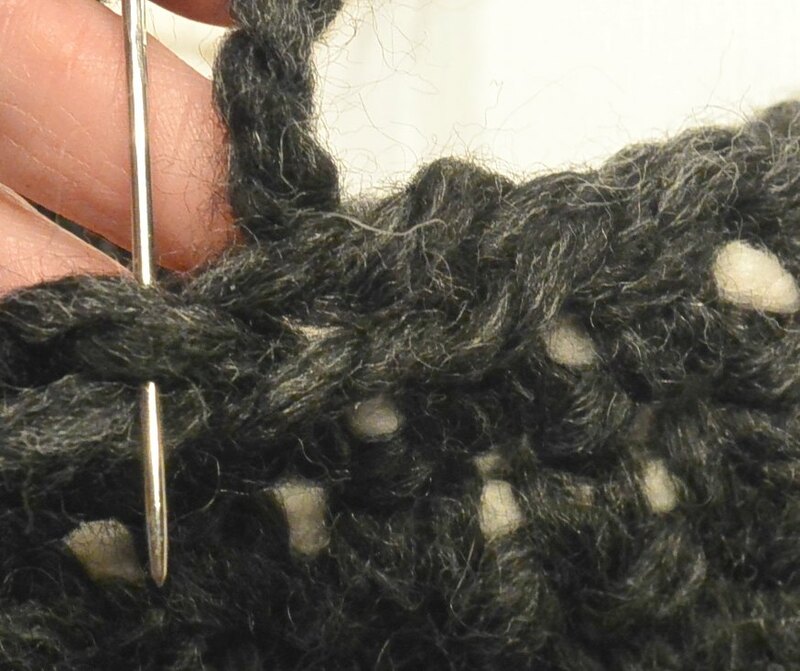 Above: Work the tapestry needle and length of thread through the stitches on the top of the hat. Pull tightly to cinch closed and tie off. That’s it! 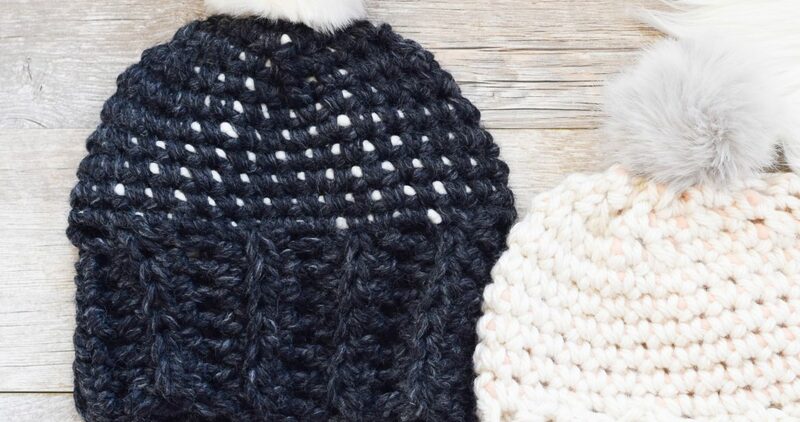 I hope that if you’re a new crocheter, this hat will be a fun little project where you can stretch your skillz and also have a hat that you’re proud of. 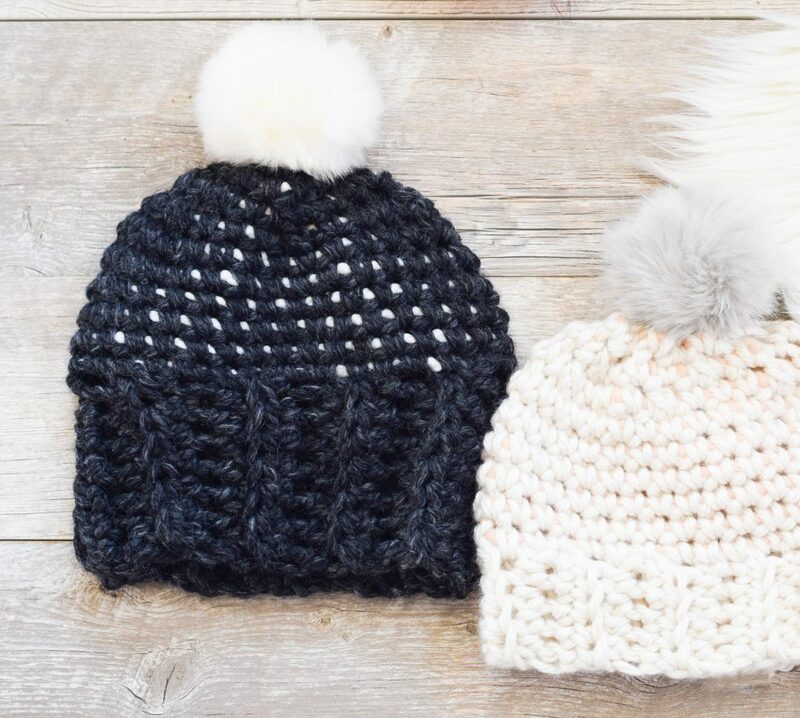 Such cute hats!! And your daughter is adorable. I agree that the pom pom keychains are SO much easier to find – and I order mine from Ebay, which are about $1.50 each, as long as you don’t mind wait a bit for them to show up> i stockpiled. 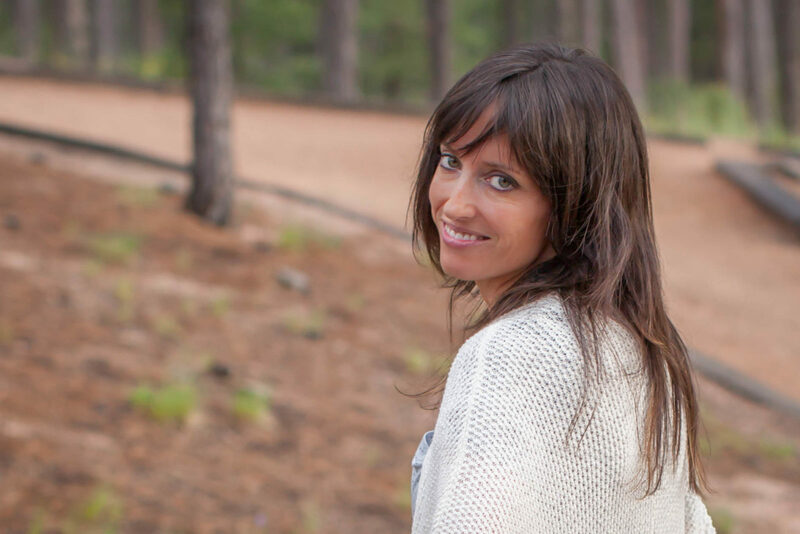 Thanks for sharing Julie! It makes much more sense to spend $1.50 rather than what I spent. Ugh! I’m so glad to know that we can find them for so cheap on EBay. Definitely worth the wait for them to ship. You can also get the poms at Joanns for around $4 each if you don’t want to order online. Still a better price than what you paid. I make my own faux fur poms out of fur fabric! That way they’re exactly the size I want them. My local hobby lobby has several different fur fabrics. I just haven’t been able to get light pink or grey but there are different browns, black, and white! I can make 12 of quarter of a yard of fabric and it only costs $5!